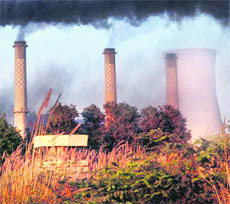 The announcement by Deputy Chief Minister Sukhbir Singh Badal on the shutting down of the ash-spilling 440 MW thermal power station of Punjab State Power Corporation Ltd (PSPCL) in the heart of the town here has come as music to the ears of local residents who were suffering because of the high level of pollution caused by the plant. The thermal plant set up 37 years ago is to be dismantled as it has outlived its utility. Townsmen had approached the High Court and the Human Rights Commission to protect them from the pollution being caused by the plant. Several social organisations have welcomed the closure announcement but PSPCL engineers are against the move. The power corporation had already closed one of the units for renovation and this expenditure on repairs will go down the drain when the plant is dismantled. The thermal plant has been running without electrostatic precipitators that arrest the flow of ash from the chimneys, resulting in a thick layer of ash in houses. The plant everyday burns two train-loads of about 6,500 tonnes of coal, generating a high quantity of ash. The coal is brought from Bihar, Chhattisgarh and Jharkhand. MM Behal, convener of the action committee against the pollution caused by the thermal plant, said the decision was in the right direction and the action committee had approached the High Court for ordering the closure of the plant in case the government had no plans to modernise it. He said the state government had failed to meet its commitment of taking steps towards controlling air pollution by June last. Dr Amrit Sethi, an eye specialist, said that eye ailments had increased due to the air pollution caused by the thermal plant. Another doctor said respiratory diseases, particularly among children, had also increased in the town. Experts claim that the ash ponds of the thermal plant were one of the causes of contamination of ground water with a high uranium content. The foundation stone of the plant comprising four units of 110 MW each was laid on November 19, 1969. The project was completed in two phases at a cost of Rs 115 crore. The first unit was commissioned in September 1974 and the other units were subsequently commissioned in September 1975, March 1978 and January 1979. A senior PSPCL functionary said that all the four units had outlived their designed life. Various equipment, including the boilers and turbines had deteriorated, restricting power generation to about 95 MW against the installed capacity of 110 MW. A Rs 400 crore proposal for renovating the project had been approved to extend the plant’s life by another 20 years. Not only the local thermal plant, but Guru Hargobind Thermal Plant (GHTP) at Lehra Mohabbat is also consuming about 12,000 tonnes of coal everyday. However, the plant has the latest techniques to control pollution.